Food and Fuel America.com: Dear Oil Industry: Sorry to Hear About The Spill (Again). Can We Help? 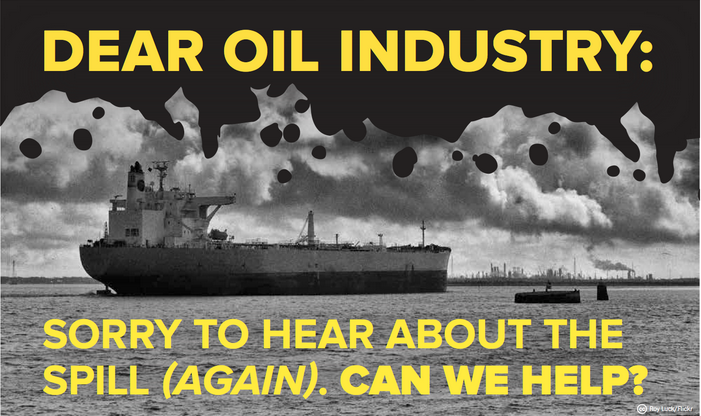 Dear Oil Industry: Sorry to Hear About The Spill (Again). Can We Help? Despite the millions of dollars your industry has spent on bogus TV ads, there hasn't been a single reported case of engine damage from ethanol blended fuels like E15. But last week, Exxon admitted selling customers in Louisiana more than 5 million gallons of oil-based gasoline that was so bad that it’s been stopping cars dead in their tracks. In fact, one auto shop reported 40 or 50 customers who had trouble starting their engines as a result of Exxon’s contaminated gas. That's 40 or 50 more cases of engine problems than have been reported in the entire country from E15, and that's just one shop in Baton Rouge! Maybe the oil industry should quickly rig another study – like the study the oil companies cooked up to show engine valve damage from E15 by pre-selecting engine types already known to have engine valve problems. That was a good one, Jack. Too bad scientists from America's national laboratories, the U.S. Department of Energy and the EPA did a real study and found no evidence of engine damage from E15 whatsoever. As if selling tainted gas to thousands of unsuspecting drivers wasn’t bad enough, then you had another embarrassing oil spill by one of your member companies in the Houston shipping channel. Isn’t that funny? While your ads are misleading people about the impact of ethanol on marine engines, boats in Houston are in dry dock because of your oil spill! In fact, that one company has been fined for 77 different oil spills since 2008, which means they have averaged more than one oil spill per month for the last six years. That’s a lot of boaters impacted by oil spills, Jack. Then there was BP’s oil spill in Lake Michigan last week, which turned out to be much larger than BP executives first admitted. BP lowballing the size of an oil spill? Knock us over with a feather! You know what else is ironic, Jack? How about running ads claiming ethanol is bad for the environment in the same week when you just spilled 20,000 gallons of crude oil into an Ohio nature preserve? Or claiming that ethanol – a clean, renewable fuel – consumes too much land, when current and future tar sands operations will destroy an area the size of Florida? Were you aware, Jack, that the Deepwater Horizon spill polluted an area of the Gulf the size of Oklahoma? We can go on ... how about the fact that current U.S. crude oil pipelines threaten an area the size of Rhode Island with spills just like the one last week in Ohio. The Exxon Valdez spill impacted an area the size of Massachusetts. The Persian Gulf spill in 1991 affected an area the size of Maryland. Do you get the point? You see, Jack, the real environmental peril is oil, not renewable fuels like ethanol.